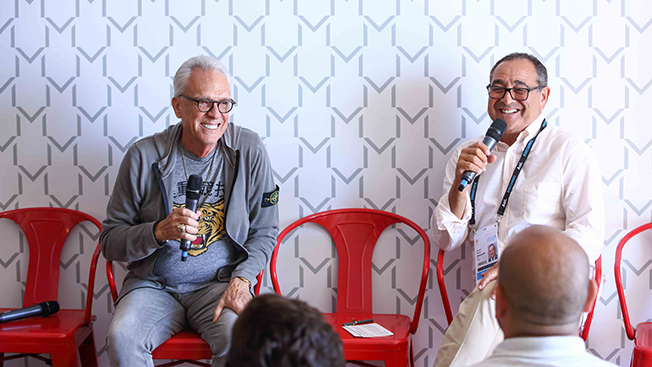 CANNES, France—Norm Pattiz has been called the Prince of Podcasts, but after a quick survey of his four-decade career, the Wizard of Wireless may be a more apt nickname. The Los Angeles native revolutionized radio after founding Westwood One in 1976, and now the 73-year-old is attempting to do the same with podcasting. He launched Podcast One three years ago and has already grown it to include more than 200 programs hosted by the likes of Adam Carolla, Shaquille O'Neal, Stone Cold Steve Austin, Snooki, Larry King and Laura Ingram. Pattiz's timing would seem to be perfect, considering the surge in popularity of podcasts, most notably NPR's Serial. "I wasn't surprised by the popularity of Serial," Pattiz said, when asked about how fast the space is advancing. "I was surprised by the popularity of Stone Cold Steve Austin. I kid you not." Pattiz definitely brought his A-game to Cannes Lions, where he spread the word about how podcasting is building audience while radio loses market share. He's supported by recent comScore research that found consumers prefer podcast advertising over ads in any other digital medium. "Radio should have embraced digital and made it part of radio," Pattiz said. "[PodcastOne gets] probably 40 percent of all the advertising revenue in podcasting right now, and we're about 80 to 85 percent of all the brand business. And the reason that we're getting brand business is because we don't sell downloads. We have invested in third-party suppliers who have modified their technology to give us what we need to make advertisers happy with us." Here, more from our conversation with Pattiz at the MediaLink space in the Sean Connery Suite of the Carlton Hotel in Cannes. Adweek: Your business is just a few years old. Tell us how things have been going. Pattiz: Last year, we were downloaded 1.5 billion times, so since only a third of Americans have ever listened to a podcast, there's a very good chance that they're listening to something that we're doing. So it gives us a great promotional platform, the same thing that we give to an advertiser. What does the industry need to know about podcasting? Last year, I was invited to give the keynote speech at the Dash convention. And I said, are you sure you want me to do this, because this is all about the in-dash solution for cars. I said, I don't believe in in-dash solutions. He said, say whatever you want to say. So I said, look, I know this is about the in-dash solution. We have an in-dash solution. It's right here. [Points to his smartphone.] It immediately connects my Bluetooth to your car. It goes right to the site of the podcast you want to listen to. You're one click away from listening to what you want to listen to. Please explain your recent deal with the Associated Press. We made a deal with the AP, so at the end of each program they say, "Stick around for 60 seconds of AP News." We know that 65 to 70 percent of the audience actually sticks around. The post-roll break has been meaningless because when the show's over, so are the consumers. They're gone. But if 65 to 70 percent stick around to listen to a newscast, I can put spots in the break between the show and the newscast, which gives me another spot or two to sell—which is good for business. And if you listen to that podcast now and I listen to it eight hours from now, we'll be listening to different newscasts because we'll grab the latest newscast. You said that radio should have embraced digital. Why didn't it? Is it because the ad sales people didn't want to change their pitch, or the executives didn't want to invest in the software? Why didn't it happen?